It’s not easy to manage your iPhone music if you have a huge collection. Sometimes loading times and syncing can take forever if you used iTunes. Most people feel like they’re stuck using iTunes since it’s the official Apple tool for managing your files—but is this really true? Syncing overwrites the library on your device, which can delete music that you already have on there. You are limited in what music you can transfer from your iPhone to your PC. If a music file is obscure or can’t be used by an iPhone directly, it won’t convert the file for you. You can’t share you music with other devices that have different Apple IDs, such as your friends’ devices. It can be really slow and bloated at times. iMyFone TunesMate is one of the best iPhone music or file managers available. It lets you view files, delete them in bulk, and of course transfer them to and from your PC. It’s an all-in-one manager that allows you to take full control of all your iPhone or iTunes media. It saves you time and energy especially when you have a huge collection of music to manage. It also manages videos, photos, audiobooks, iTunes U and more. Two-way sync to freely transfer music between iPhone and computer, between iPhone and iTunes library. Backup & Restore: Back up your iPhone/iTunes music so that you can restore backup anytime you need it. Delete iPhone selectively at bulk or all at once. Manage iPhone Music and Playlists: Rebuild or create your own playlist, you can share it to different devices. Manage Ringtones: Customize tones from any song, transfer ringtones freely and delete unwanted tones. Syncing iTunes music to iPhone without overwriting the existing data. It can transfer music files from iPhone to computer, or from computer to iPhone. You can transfer also video, photos, and other types of files. You can edit the song information of the music files. 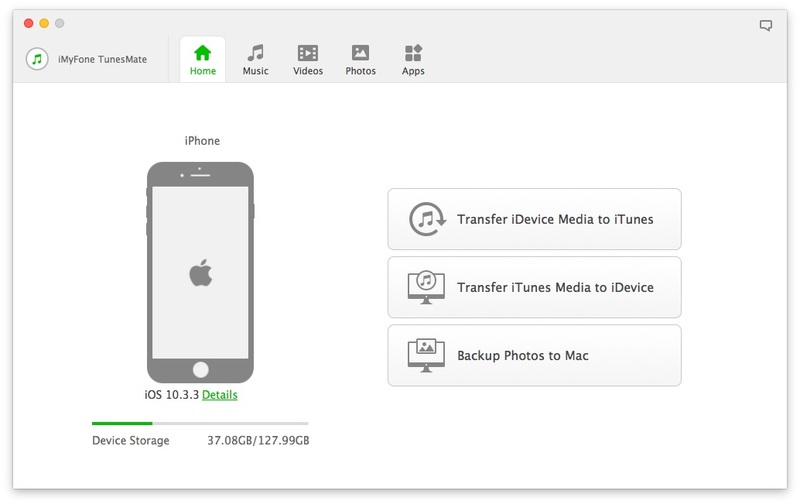 You can transfer back and forth between your PC and your iPhone. Export your iPhone files to your computer or iTunes. 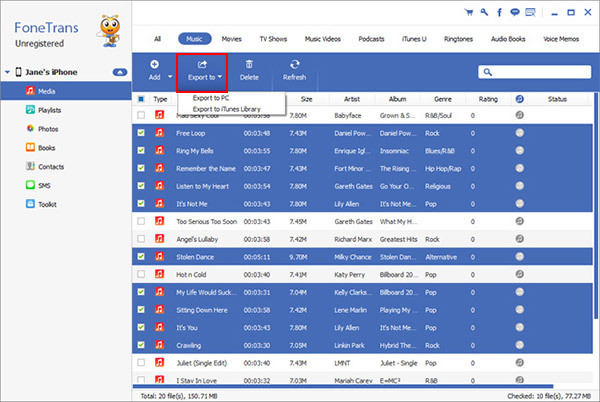 You can manage the music and playlists. From the comparison, you may have your own opinion on which one to try. Obviously, TunesMate has much more great features yet in lowest price. That’s why we recommend TunesMate as the top 1 for you. Since now, you have your own choice, don’t be hesitate to manage your iPhone music. Since iMyFone TunesMate would be your best choice to manage iPhone music, here we take TunesMate for example to show you how to manage your iPhone music without iTunes. Step 1: Launch iMyFone TunesMate on your computer and connect your iPhone. Step 2: You will see a tab that says Music at the top. Click on this tab, and you will see a list of the music that is on your iPhone. 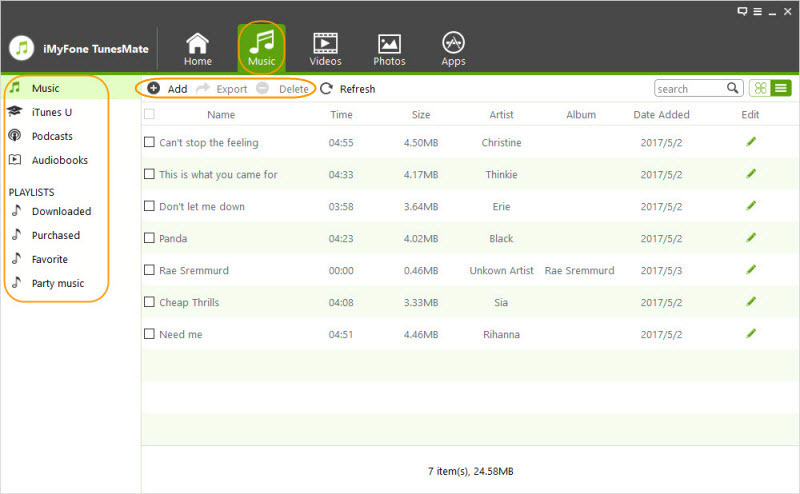 On the left sidebar, you can also switch through different music categories and locations. Step 3: On the right panel, you will see the functional option at the top: Add, Export and Delete. Click on any feature and go ahead to finish the management. Add: This feature allows you to add music files to your iPhone from computer, external hard drive or android device. Export: This feature allows you to export music from iPhone to your local computer, iTunes library, or external hard drive. Delete: This feature allows you to delete iPhone music selectively. 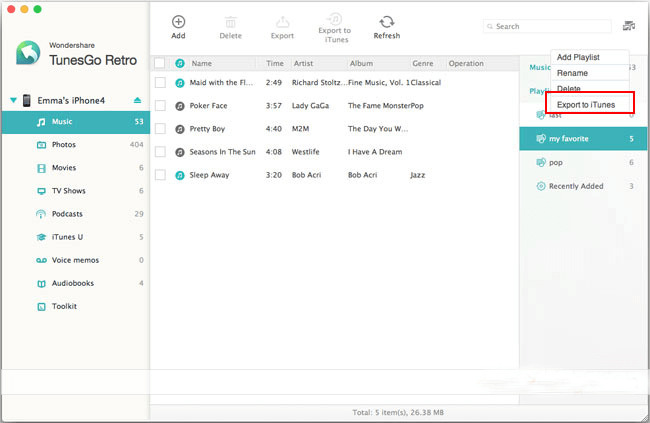 iMyFone TunesMate’s free trial allows you to manage 5 music files. You can have a try. If you need to manage more files, please get a license to register and enjoy its unlimited functions.